The person in this video is a conservative, black teenage girl. She reads some of the racist, hateful, and profanity-laden messages that Democrats have sent her. This video contains profanity and racial slurs. It’s definitely not something to play if you are at work. March 13, 2019. Tags: Black conservative reads HATEFUL and RACIST messages, Politics, Racism, Videos. Racism. Leave a comment. Hillary Clinton is not a stupid person. The Washington Post gave her four Pinocchios – its worst possible rating – for her statement. Who would be stupid enough to believe such a ridiculous lie? The same people who were stupid enough to believe that Jussie Smollett (or anyone, for that matter) would leave a noose around his neck for 45 minutes. What Clinton, Smollett. and the many, many, many people who commit fake hate crimes (you can see a whole bunch of fake hate crimes documented here) are showing to the rest of the country is that the demand for racism, homophobia, etc., in the United States greatly exceeds the supply. And that demand is not coming from Republicans, conservatives, or libertarians. Instead, this massive demand for racism, homophobia, etc., is coming from liberals, progressives, social justice warriors, and others on the political left. To normal people, it’s considered a good thing when people are happy and get along with each other. But not to the social justice warriors. To the social justice warriors, the worst possible thing that could ever happen is for people to be happy and get along with each other. Which is why the social justice warriors are constantly making up so many fake hate crimes. March 7, 2019. Tags: four Pinocchios, Hillary Clinton, Politics, Racism, Washington Post. Racism. 3 comments. February 23, 2019. Tags: Fake hate crimes, Humor, Jussie Smollett, LGBT, Politics, Racism. Fake hate crimes, Humor, LGBT, Racism. Leave a comment. February 23, 2019. Tags: Fake hate crimes, hate crimes, homophobia, Jussie Smollett, LGBT, MAGA hat, Politics, Racism. Fake hate crimes, LGBT, Racism. Leave a comment. But it’s obvious to me that Northam is the guy in blackface, because the other guy looks exactly like Robert Byrd, who was a Democratic U.S. Senator from the state of West Virginia. According to this article from the Washington Post, before Byrd was a U.S. Senator, he started his own chapter of the Ku Klux Klan, and recruited 150 of his friends and associates to join it. As we all know, the Ku Klux Klan was started by Democrats who were upset that Republican President Abraham Lincoln had forced them to free their slaves. So when Byrd decided to run as a U.S. Senator, he knew that he had to run as a Democrat. Byrd died in 2010, when he was still in office. If he were still alive and healthy today, he would still be in office. February 2, 2019. Tags: blackface, CNN, Eastern Virginia Medical School, Hillary Clinton, KKK, Ku Klux Klan, photo, Politics, Racism, Ralph Northam, Robert Byrd, yearbook. Racism. Leave a comment. Corinne Bendersky is Professor of Management and Organizations at UCLA Anderson School of Management, and is also the school’s faculty director of the Human Resources Roundtable Association. In her column, Bendersky explains why she believes more women should be firefighters. But she herself is not a firefighter. My own personal belief is that a woman should choose her own career. If a woman wants to be a firefighter, that’s great. If she’d rather be a doctor, computer programmer, electrical engineer, astronomer, actuary, entrepreneur, stockbroker, accountant, electrician, plumber, carpenter, welder, or construction worker, that should be her choice too. But it should be what she herself wants, not what someone else like Bendersky wants. I also believe that Bendersky is a hypocrite, because while she wants other women to be firefighters, she herself is not willing to be a firefighter. Furthermore, I am in favor of meritocracy, and I am against affirmative action. There already exists at least one real world example of affirmative action in firefighting. The following is an excerpt from my book Barack Obama Is Afraid of Sharyl Attkisson: The definitive guide to the shenanigans of America’s 44th president. It begins on page 59. The Obama administration accused fire and police departments in Jacksonville, Florida, New York City, and Dayton, Ohio of “racial discrimination” because they required potential firefighters and police officers to take a written test. Ten real examples of these “racist” questions from the New York test can be read here. It is extremely easy to pass the New York Fire Department’s written test. The test is multiple choice. A group of firefighters and their officer respond to a fifth floor apartment in a seven-story building. When they arrive at the apartment, they are told that the contents of a wastepaper basket was on fire, and the fire was extinguished prior to their arrival. The officer instructs the firefighters to ventilate, or remove, the smoke from the apartment by first using a method that will not cause damage to property. Which one of the following would be the most appropriate method for the firefighters to use to remove the smoke? A) Breaking out all the windows with a crowbar. B) Pulling down the ceiling with a six-foot hook. C) Cutting through the floors with an eight-pound axe. D) Manually opening all the windows and removing the screen. Firefighters are required to operate on the subway tracks during emergencies in the subway stations. Which one of the following would present the greatest threat to the safety of a firefighter working on the subway tracks? A) A subway platform crowded with people. B) Rubbish burning in a small garbage can located on a subway platform. C) A subway car entering a station. D) A maintenance crew working on the track. Firefighters conduct building inspections to locate potential life-threatening conditions in the even there is a fire. Which one of the following would the most-serious threat to life in the event of a fire? A) An unlocked front door in a building. B) A locked basement door in a building. C) A car in the driveway of a building. D) A building with a missing fire escape. Obama then ordered the New York Fire Department to hire black firefighters who scored only 30% on that test. That’s 30% right – not 30% wrong. 30%, on an open book, multiple choice test, with questions so easy that you’d have to be a complete idiot to get them wrong. One of the unqualified black people that Obama pressured them to hire is a guy named Michael D. Johnson. As of May 2015, Johnson had been working as a firefighter for the past 11 months, and was getting paid an annual salary of $76,488 by the New York Fire Department for his job as a firefighter. However, during those 11 months, Johnson refused to actually fight fires. December 31, 2018. Tags: Affirmative action, Barack Obama, Corinne Bendersky, firefighters, Harvard Business Review, Making U.S. Fire Departments More Diverse and Inclusive, Obama, Politics, Racism, Sexism, Social justice warriors, UCLA. Barack Obama, Racism, Sexism, Social justice warriors. Leave a comment. December 28, 2018. Tags: California, overwhelmingly white, Politics, Racism, Sexism, women's march, Women's rights. Racism, Sexism. 2 comments. In the first five minutes of this video, this woman goes on and on about how happy and excited she is because she just got back the results of her mitochondrial DNA test. She took the test because she wanted to find out which African tribe or tribes she is descended from. A person (male or female) inherits Mitochondrial DNA solely from their mother. After five minutes of joyous anticipation, she finally opens the envelope and looks at the results. December 17, 2018. Tags: African Ancestry, AfricanAncestry.com, DNA, DNA test, genetics, mitochondrial DNA, Nia Hope, Politics, race, Racism, Science. Racism, Science. 5 comments. Pompeo was then cast in ABC’s popular medical drama Grey’s Anatomy, and garnered worldwide recognition for her portrayal of the title character Dr. Meredith Grey. The role on the long running series earned her a Golden Globe nomination and a Screen Actors Guild Award. The character became widely popular, making Pompeo one of the most renowned television actresses. In 2016, Pompeo was ranked fourth in the list of highest paid TV actresses by Forbes, with earnings of $14.5 million; she became the third highest paid female and the fifth highest paid actor overall in 2018 with earnings of $23.5 million. She was also the highest ranked actor from a drama series on the list. OK. That’s fine. Although I myself have never watched Grey’s Anatomy, there are obviously a lot of other people who do, and I don’t have any problem with that. And I don’t have any problem with all of the money, awards, and prestige that Pompeo has received for her work on that show, as well as from her other endeavors in the entertainment industry. What I do have a problem with, however, is the incredibly huge amount of hypocrisy in Pompeo’s statement that was reported in the article from earlier today. Then Pompeo starts to cry, just to make sure that everyone knows how much she cares about this issue. But she’s a fake and a phony. If she truly cared about this issue, then she wouldn’t just be asking for other white people to give up their jobs so there can be more diversity. Instead, if she truly cared about this issue, then she would give up her own job so there can be more diversity. But Pompeo didn’t do that. She’s not willing to give up her own job so there can be more diversity. She just wants other white people to give up their jobs so there can be more diversity. She is a hypocrite in the worst possible way. Shame on Ellen Pompeo for not practicing what she preaches. November 20, 2018. Tags: Affirmative action, director of another endorsement project, Diversity, Ellen Pompeo, Grey's Anatomy, I don't see enough color, I would like to see the crew look like the world that I walk around in every day, Political correctness, Politics, Porter, Porter magazine, Racism, Social justice warriors, Virtue signalling, we can all do better. Political correctness, Racism, Social justice warriors. 3 comments. A black woman named Adwoa Lewis complained to the police that she had received a racist handwritten note from four white teens who had slashed her car’s tire, shouted“Trump 2016!” and told her that she did not belong there. Lewis then filed a written complaint with the police. The police then realized that it was Lewis herself who had written the hateful note. The police have since charged her with making a false statement to the police. I didn’t know that anyone who was intelligent enough to write, could simultaneously be dumb enough to think that the police wouldn’t realize that it was her own handwriting on the hateful note. September 17, 2018. Tags: Adwoa Lewis, Donald Trump, Fake hate crimes, hate crimes, Politics, Racism. Fake hate crimes, Racism, Social justice warriors. 1 comment. Julius Sello Malema (born 3 March 1981) is a Member of Parliament and the leader of the Economic Freedom Fighters, a far-left and racial nationalist South African political party, which he founded in July 2013. He previously served as President of the African National Congress Youth League from 2008 to 2012. Malema was a member of the ANC until his expulsion from the party in April 2012. He occupies a notably controversial position in South African public and political life, having risen to prominence with his support for ANC president, and later President of South Africa, Jacob Zuma. He was described by both Zuma and the Premier of Limpopo Province as the “future leader” of South Africa. Less favourable portraits paint him as a “reckless populist” with the potential to destabilise South Africa and to spark racial conflict. August 29, 2018. Tags: Genocide, Julius Malema, Politics, Racism, South Africa. Racism. Leave a comment. The protestors aren’t saying that the footage was edited, altered, or changed in any way. Instead, they are saying that the footage mischaracterized Brown. They are wrong. Instead, the footage shows exactly what Michael’s Brown’s character was like. Address Michael Brown Jr.’s character. Close the store for three days on the anniversary of his death. Create a scholarship in his name. Find ways to interact and give back to the community. Stop selling Dormin, a sleeping capsule, and other items that can be misused to get high. Retain a black-owned security company to protect the store. … the store ultimately agreed to all of the requests by Wednesday, other than closing the store for three days. Instead, he said, the store would close on the anniversary of Brown’s death and provide a free barbecue the day before. The store never did anything wrong in the first place, so there was no rational reason for the protestors to make these demands, and there was no rational reason for the store to cave in to their demands. August 27, 2018. Tags: Ferguson, Ferguson Market and Liquor, Michael Brown, Missouri, Political correctness, Politics, Racism, Social justice warriors. Political correctness, Racism, Social justice warriors. 2 comments. Denmark bans Muslim women from wearing full-face veils. As a person who values individual liberty and limited government, I’d be very much opposed to a law like this in the U.S. It would be a violation of the first amendment, as well as something that I would view as being totalitarian. But Denmark is the “happiest” and “most progressive” country in the world, and who am I to tell them what to do? I do have to wonder why Muslims would immigrate to Denmark when it is so Islamophobic. August 4, 2018. Tags: Clothing, Denmark, Denmark deemed most progressive place in the world to live, face veil, First woman fined in Denmark for wearing full-face veil, full-face veil, happiest, Islamophobia, most progressive, niqab, Progressivism, Racism, Religion, Welcome to the happiest country on Earth. Clothing, Racism, Religion. 2 comments. If the biggest racism problem in the U.S. is whites being racist against blacks, then how come the rate of “whites killed by blacks” is more than 12 times the rate of “blacks killed by whites”? 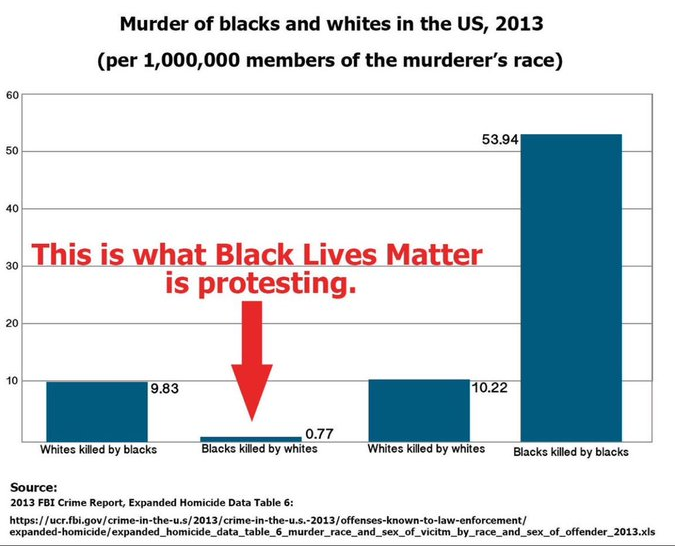 As I’ve pointed out many times before, the Black Lives Matter protestors don’t care about the 93% of black murder victims who are killed by other blacks. Here’s a webpage from the FBI that gives even more info. I think that chart is extremely informative. July 28, 2018. Tags: black, Black lives matter, Black on black crime, Black on white crime, Crime, FBI, FBI crime statistics, hate crimes, Murder, Murder rates by race, Politics, Racism, Rates, Statistics, Violent crime, White, White on black crime, White on white crime. Black lives matter, Racism, Violent crime. 2 comments.